Alison arrives at the beach house in June to spend a month with her restless grandson before he leaves for his first year of college. More than a decade earlier, Alison lost her beloved husband, and has faced life alone ever since. Now she discovers a new life and a possible new love. August brings together four college friends facing a milestone. During summer’s final days, they share laughter, tears, and love—revealing long-held secrets and creating new and even more powerful bonds. World-class wildlife photographer Matthew and award-winning war photographer Lindsey arrive at the beach house in January, each harboring the very real fear that it will mark the end of their decade-long love affair. Alone in the house’s warm peace, they are forced to truly look at who they are and what they want, discovering surprising truths that will change their lives forever. 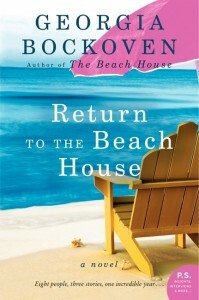 I’d read the original The Beach House a couple of summers ago, and I love beach novels, so when I was offered the chance to read and review the latest installment in Georgia Bockoven’s collection, I didn’t just jump at the chance, I swan dove. Or maybe cannonballed. Whatever. Having spent a significant chunk of my life living in San Francisco and San Jose, I feel a special kinship with Return to the Beach House. I’ve always wanted to rent one of those houses in Santa Cruz or Capitola or anywhere else along the Northern California coast for the summer, or February, or pretty much ever. If I were rich, I’d buy one, and live there full time. But that’s about me, and not the novel. Here’s what I love about this book: it’s a novel, but it’s also an anthology, because while everything is tied together by this wonderful house – so much so that the house itself really becomes a character, it’s also separate stories. Alison and her grandson Christopher are one story. The four “alphabet girl” friends are another. The glimpses into the life of Julia, who owns the house, make lovely bookends, and further serve to tie everything together, and the stories are always related by theme, but if reading a traditional novel is too much for you in this 140-character world, this book will be palatable because of the way it’s crafted. Conversely, if you’re not a fan of novellas or short stories, you needn’t worry, because there is enough continuity, enough of a through-theme, to keep everything feeling relevant and related. Bockoven’s characters, especially the women, are vibrant, realistically portrayed people, and her sense of place is equally vivid. I could smell the salt, hear the surf, and feel the coarse, damp, Pacific coast sand under my toes. Read this book, if you love great characters, and a story that’s light enough for summer without being at all frothy or fluffy. Read this book, if you want a summer beach read that is deeply satisfying. But definitely read this book. This post is part of a blog tour hosted by TLC Book Tours. For more information, and the complete list of tour stops, click HERE.